Volksmarching | Pictures and descriptions of walking events. This blog is devoted to Volksmarching. As I do an event I will post a few pictures of the walk and a short description. I have another website where I post “all” the pictures I take at an event. Volksmarches are leisurely walks. They are through scenic, historic, and interesting areas over a predetermined route that has been checked for safety and walkability. Our walks are sanctioned by the American Volkssport Association (AVA) and the International Volkssport Association. The purpose for doing sanctioned events and not just walking at a local park is to collect stamps in our record books. 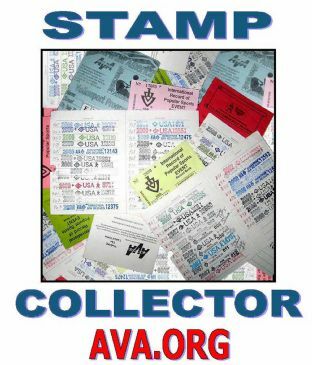 Stamp collecting becomes a passion. We have event record books, distance record books, and special program record books. I have completed the special programs for walking College Campuses. For a list of walks I did for that program you can visit here. I also completed the one for walking along/over Rivers. For a list of walks I did for that program you can visit here. I have also completed the Murals Special Program..
No matter how many sets of books you decide to keep, you only pay $3.00 for each walk. After paying the $3.00 and completing the walk you can collect stamps in ALL of you books. You become very proud of your stamp collection! Can’t find the photos of Jeffereson? oops nevermind. I found the link. Hello there – I saw that you stopped-by my blog today…thank you for visiting and for letting me know you were there. Have you been volksmarching in Germany? Things might have changed since I was there, but they had medals you could purchase, silver or gold, depending on whether you went the 10K or 20K route…and lots of bratwurst and beer at the end with all the oompah music your stomach could tolerate! Never had the privilege of Volksmarching in Germany. I have heard many stories about it though. I’m stuck with the Americanized version. No music and food at only a few events. I have a drawer full of event awards, I quite buying them. I buy an occasion t-shirt if I like the design. If you ever have a chance to get over there, I’d recommend a go at it. They are usually in commemoration or celebration of something or someone and the medals reflect the nature of the event. Hey…what a cool program! I hadn’t heard of it so I’m doubly happy you stopped by my blog! I’ll look forward to checking it out…there must be some recognized treks in Montana. Neat! Volksmarching is completely new to me. I have never heard of it before visiting your blog. Thanks for introducing it to me. I will have to learn more! I’ve not heard of Voksmarching before, but it looks very interesting. Could you maybe post a photo of the stamp book and the stamps? It isn’t a very good picture. I just piled some of my filled books together and snapped a picture. You also get pin/patch when you finish up a book. 🙂 I can see how the stamp collecting can become as addictive as the walks! Hope you find the group to your liking. Catherine is the club president right now. Hope to see you on the trail! Hope to run into you, too! Hi Kristen, I Volksmarched for years. I completed thousands of K’s and MANY, MANY, MANY Walks. At the time (1970’s)I was the ONLY American to complete the “DEATHMARCH” in Germany (took me 20 hours with a fractured thigh). I was President of the Landstuhl VM Club. I know how GOOD VM’ing is for everyone. Age and other things have stopped me but my wonderful memory is still intact. Wishing you and everyone continue ‘walking’ and HAPPY WALKING!!!!! ӏ enjoy ԝhat you guys are up too. Such clever work and reporting! Keep up the great works guys I’ve included you ǥuys to my blogroll.